Take a bowl. Add farali flour, apple, salt, cinnamon powder, oil and mix it well. Add water and knead dough. Make 10-12 small balls. Roll the balls in flour and roll the paratha of about 5-6 inch diameter. Take non-stick tawa and cook it on both the sides smearing with oil on medium flame. 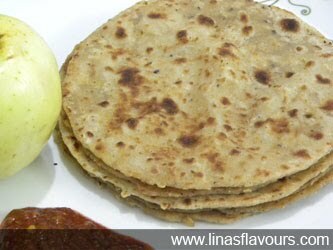 Prepare all the parathas in the same way. Serve with any tangy chutney or raita. You can even use wheat flour if you are not preparing for vrat.